Hard water. It's our life in this neighborhood. Seriously, our neighborhood is known in the "water circles" for some of the worst water in the nation. I'm not kidding. True story....or so I've been told by "water experts." I'm not going to bore you with the many times I have written about our hard water woes and what it does to things. Just search hard water in my search box if you happen to have spare time. Or your favorite show is a rerun...no wait, I'd probably watch the rerun. About three years ago I wrote about my lucky find of Lemi-Shine. Love that stuff. It's a glorious, glorious thing if you have hard water. I even got my neighbor using it recently! No commission or anything. But I was fortunate enough to have Lemi-Shine contact me again and ask me to try out their new product. I didn't even have to write this post or anything, but since I only write what I think...and I think I love this stuff...I'm going to write about it. Okay, I love it. And I'm going to write about it. Lemi-Shine Pacs! They're kinda like a super hero of hard water cleaners. I should have put a little cape on that bag when I took the photo. It's like Lemi-Shine out of the bottle packaged up pretty and put under the Christmas tree. 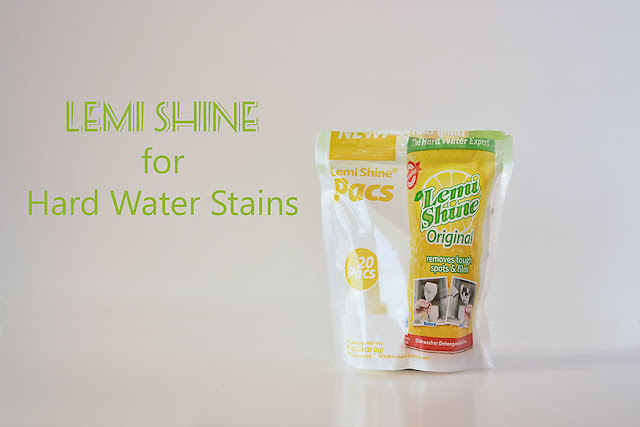 It's the original Lemi-Shine packaged up in those little convenient packages that are all the rage today. Pacs. I just pop one of those little babies in my compartment of my new dishwasher (seriously, love that thing too) and then I put the dishwasher detergent in the bottom of the dishwasher. Then the Lemi-Shine works its magic while the dishwasher is running. This stuff is like magic, like where the magician cuts the pretty lady in half and put her back together. This stuff gets rid of the hard water stains. Honestly, it's amazing. Here's my hard water stained glass before being put in the dishwasher. And here it is after a washing with a Lemi-Shine pack. I didn't scrub it or anything. Amazing. Am I just the strange one to get excited about household products? Really, this stuff is amazing. And it smells good. I love citrus. 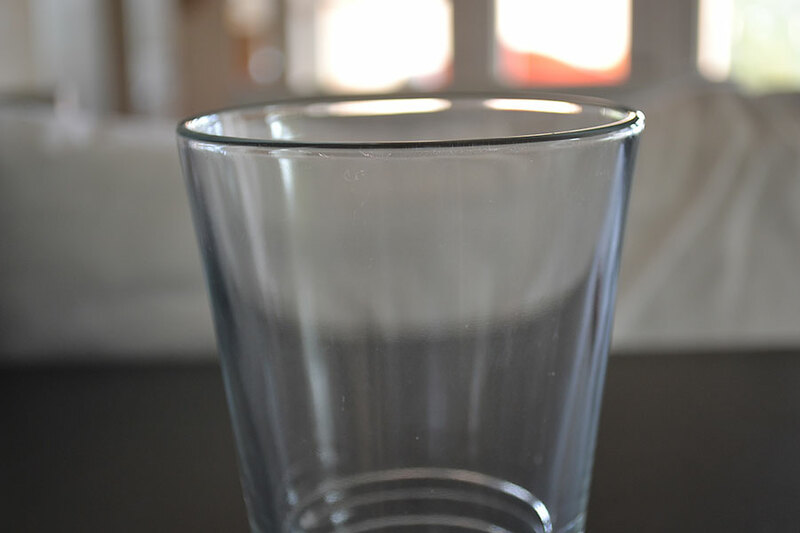 So...if you have hard water stains, try this. You can even clean your dishwasher with it. I find mine at Target, but I'm sure it's carried at other places like grocery stores and Wal-Mart. 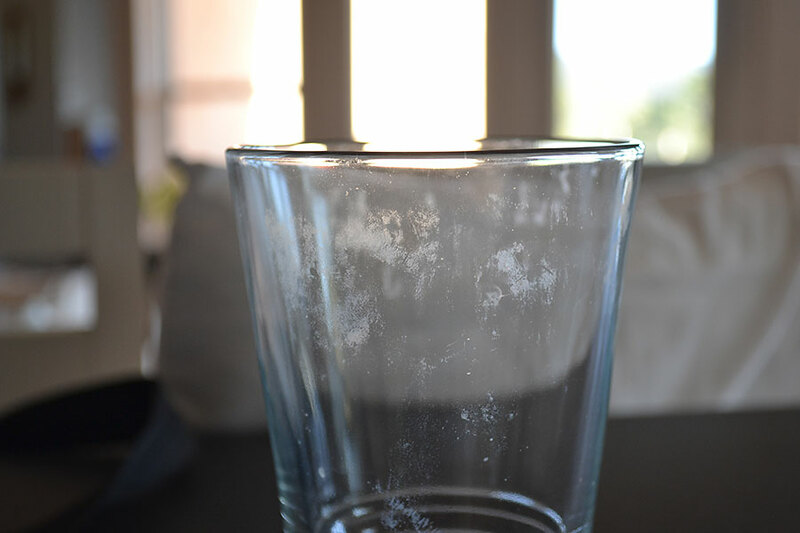 What do you do for hard water stains?